Christian dieting plans offer a variety of approaches to weight loss and healthy eating, but the one thing these different approaches have in common is an element of faith. For most, the goal is to eat and take care of the body in a way that pleases God. For people of the Christian faith who want to lose weight or take better care of themselves, Christian dieting plans offer guidance from God's word to support why they should make healthy choices and take care of their bodies. According to the Bible, the body is the temple of God and with this in mind, Christians who want to lose weight often choose a Christian diet plan because it helps them draw strength to do the right thing from God's word, even in regards to eating. Another benefit to following most Christian diets is that they offer Scripture verses related to dieting for meditation. These verses help the dieter to stay focused on God's word and his will. While many diets claim to be biblical, it is always important to do your research. If a diet is based on one verse taken out of context, then the diet may not really be biblically sound after all. Just because a diet claims to be Christian or biblical does not necessarily mean that it is. For instance in Romans 14:2 it says, "For one believes he may eat all things, but he who is weak eats only vegetables." Does this mean anyone who eats a vegetarian diet is weak? The answer is no. It is always important to look at Scripture used to support a diet's claims. Determine who the Scripture is written for at the time and the circumstances surrounding what was said. Romans 14:2 had more to do with religious practices than dieting as we know it today. The Halleluiah Diet is based on Genesis 1:29, "And God said, "See, I have given you every herb [that] yields seed which [is] on the face of all the earth, and every tree whose fruit yields seed; to you it shall be for food." 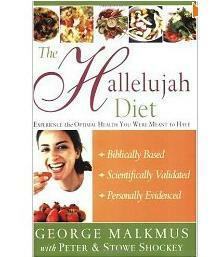 Based on this Scripture, the Halleluiah Diet recommends a diet of 85 percent raw foods and 15 percent cooked foods. This vegan diet program was started by Rev. George Malkmus who today runs Hallelujah Acres, a farm where followers of the diet can go to be trained to become health ministers. This diet promotes juicing vegetables as the most efficient way to feed our bodies the nutrients they need. The Daniel Fast is based on the life of the Old Testament prophet, Daniel, when he was brought into captivity and refused to eat the king's food. Instead, in Daniel 1:12, he asked, "Please test your servants for ten days, and let them give us vegetables to eat and water to drink." The account goes on to explain that at the end of the ten days, Daniel and his friends were healthier than those who ate the king's food. This Scripture has generated a number of different diets known as the Daniel Fast. Some are stricter than others. The thing to remember about this approach is that it is a fast. A temporary elimination of certain foods from the diet, but it is not a lifestyle diet to follow for the long term. Prism is a low calorie approach to eating that helps to re-educate people regarding their eating. This diet takes dieters through phases. The first phase eliminates foods like bread, sugar, potatoes and pasta. It also requires the counting of calories and assigns homework which gets the dieter into the word of God. Assignments deal with eating issues, personal feelings, and applying God's word to the subject in a way that helps strengthen the dieters resolve based on their faith. Following a diet is not a matter for blind faith. Just because a diet claims to be Christian or biblical does not mean that it is healthy. Do your homework and check out the premise for the diet. Feel free to talk to your doctor for his advice, as well.